Dumpsters sit outside the mansion while "renovations" continue in early 2015. Nathaniel L’Hommediue McCready died on October 3, 1887 at the age of 66. The President of the Old Dominion Steamship Line, he had lived in a handsome brownstone rowhouse just off Fifth Avenue at No. 10 West 22nd Street. After providing an annuity for his widow, Caroline, the will divided his vast fortune equally among his three children. Son Nathaniel L. McCready Jr. was a stock broker; however his interest in work fell far short of that of his father. 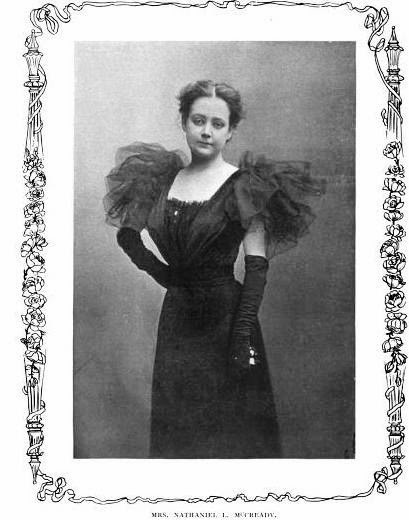 On February 10, 1891 McCready married Jeanne Borrowe. The New York Times called Grace Church “the scene of a brilliant wedding.” The social status of the young couple was evident in the guests occupying the pews that afternoon—Manhattan aristocrats like the Cornelius Vanderbilts, the Cooper Hewitts, Mr. and Mrs. Hermann Oelrichs, Mr. and Mrs. Stuyvesant Fish, Mrs. Heyward Cutting, a host of Beekmans, and other names including Morgan, Rhinelander, Pyne, Post and Whitney. The newlyweds purchased an estate in France where they spent most of their time until 1894 when they began plans for a Manhattan winter home. In 1895 construction began on the mansion. McCready’s building site engulfed two plots at Nos. 4 and 6 East 75th Street—a total of 50 feet in width. He had engaged the architectural firm of Trowbridge, Colt & Livingston to design a mansion quite unlike any other in New York. Completed in January 1896 the limestone-fronted mansion was a severe adaptation of French Renaissance domestic architecture. Four stories tall, the dormered fourth floor displayed elements of Francois I, providing visual interest. A delicately-designed iron balcony stretched the width of the second floor. Forum added “Young Mr. and Mrs. McCready have a fine residence abroad as well as here, and pass half their time on the other side. Their large house here at 4 East Seventy-fifth street is one of the finest of the modern dwellings of that locality. An attempt to depart from the conventional plans in vogue was made in its construction, and it has a porte cochere like foreign dwellings. As with all fashionable homes of the 1890s, there was an “Oriental room.” Its walls were covered in heavy white silk embroidered in gold. If the McCready home indeed once had a porte cochere as Forum reported, it was later removed. Perhaps surprisingly, while the McCreadys only sporadically opened the house, they kept it for 21 years. They sold the mansion to V. Everit Macy in May 1917. Fabulously wealthy, Macy had inherited $20 million in 1876 at the age of 5 upon his father’s death. He and his wife, the former Edith Carpenter, had two sons and were perhaps more interested in philanthropic causes than social activities. For 25 cents dough boys slept on “white iron beds with fresh linen every day—and white spreads.” The Army encouraged soldiers who had just been released from the hospital to check into the house for recuperation. As the men enjoyed a billiard room, a lounge, and a reading room; they could not help noticing that they were in the mansion of a millionaire. “The carved panellings and wide fireplace, the long, deep sofas and broad chairs, the dark, narrow tables with magazines and low lamps—not the kind that grace a mission, but the sort that harmonize with a Seventy-fifth Street and Fifth Avenue residence—the window seat that fronts six windows, and all that—are great, but none too good for the men in service,” said The Tribune. The Macys did not return to East 75th Street. At the end of the war, the house was purchased by Stanley and Elizabeth Mortimer. Before they moved in architect Rafael Guastavino made two drawings for the main stairs. Whether the updated staircase was ever executed is unclear. The sumptuous wedding and the title "Countess" helped to divert attention from Edith’s recent ugly press. Three months earlier she had been acquitted of manslaughter after the “racing roadster” she was driving struck and killed two men. Stanley Mortimer was born in 1853 to a prominent old New York family. A privileged child, he was educated in Europe, then earned a law degree from Columbia University Law School. But like Nathaniel McCready, he never really held a job. A true gentleman of leisure, Mortimer filled his time with riding, fox hunting and polo playing. He and his wife, the former Elizabeth Livingston Hall, had two children, Stanley Jr., who went on to be an artist; and of course, Edith. Edith received a Reno divorce from the Count on February 4, 1929. Otherwise, the Mortimer family garnered little press other than announcements of receptions, dinners and Stanley’s activities with horsey sports. Stanley Mortimer contracted influenza in 1932 which, coupled with his existing heart disease, brought about his death in the house on March 24. He was 79 years old. Mortimer’s funeral was held in the mansion the following morning. In 1914 he assumed the presidency of the Computing-Tabulating-Recording Company. In 1924, when his firm merged with the International Business Machines Company, he became president of the newly-named I.B.M. The man who started out his business life with a salary of $6 a week was making $546,294 a year when he purchased the 75th Street house (a comfortable $9 million today). Watson and his wife, the former Jeanette M. Kitredge, had two sons and two daughters. While the house would be the scene of the expected social entertainments, it would also host some of the world’s most important figures. On October 24, 1941 The New York Times reported that the Duke of Windsor, former King Edward VII “last night dined with the Duchess at the home of Thomas J. Watson.” The following year, on June 19, King George of Greece was the guest of honor at a reception in the house. In May 1949 the Watsons gave a reception for President Eurico Gaspar Dutra of Brazil; and a year later they entertained President Gonzales Videla, President of Chile. It seemed like the end of the line for the mansion as a private house when it was purchased by Rebeka West Harkness for use by the William Hale Harkness Foundation. One of the wealthiest women in America, she was also a composer, philanthropist, sculptor and patron of the arts. In reporting on the sale on June 11, 1964, The New York Times said “The interior has hand-carved walnut paneling and ornamental ceilings, a marble stairwell and massive marble mantels.” Harkness converted the home for use as a cultural development center which included a school of ballet. It became home of the Harkness Ballet Foundation. It was here that Woody Allen hosted a lavish New Year’s Eve party in 1967. Among the attendees were Mick Jagger, Lauren Bacall, Normal Mailer, Stephen Sondheim, Arthur Miller, Bette Midler, Robert De Niro, Kurt Vonnegut and a host of other celebrities, authors, and socialites. Gloria Vanderbilt showed up with her two sons. When the mansion came back on the market in 2005 investor J. Christopher Flowers spent a staggering $53 million to buy it. He spent another million on renovations which, sadly, meant a gut demolition. He then sold it in 2011 for a huge loss. Art dealer Larry Gagosian paid $36.5 million in August that year. Gagosian embarked on a “renovation.” While the landmarked façade was preserved, nothing was left of the interiors which the New-York Tribune had described as “rich and tasteful.” The rooms where kings and queens, dukes and duchesses, and several presidents had been entertained had apparently already been bulldozed by Flowers. From the street, however, the house that “looks as if it might have been brought over from Paris and set down in Seventy-fifth-st.” is essentially unchanged. how did i miss this mansion? i took pics of its neighbors back in 2008, hmm. well very nice though. Still cant understand why people purchase magnificently intact mansions and gut them to the walls. Why not purchase a wreck in need of renovation? Glad to hear the jerk Christopher Flowers who gutted the interiors lost a bundle on his ill advised renovation. 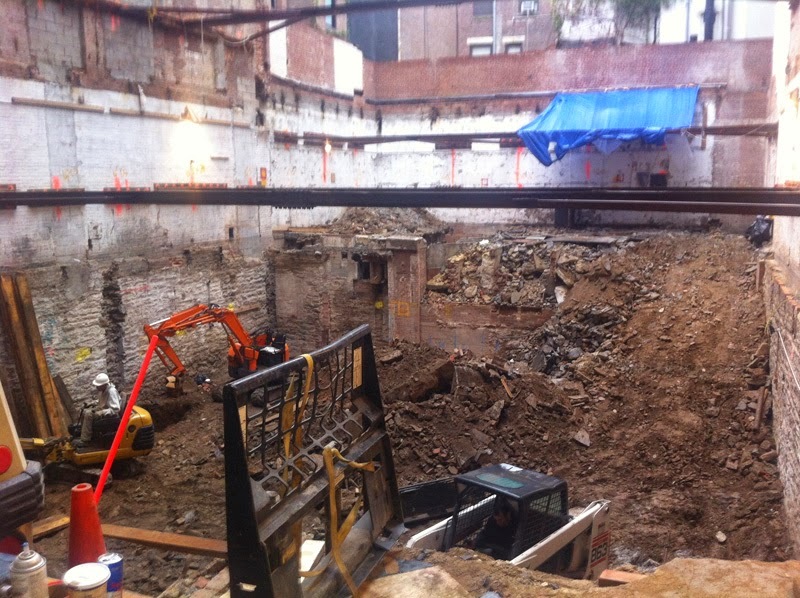 A hole in the ground behind a remaining fancy facade.